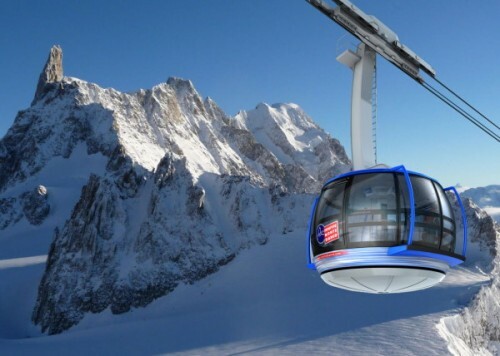 A sphere-like cableway (the sphere has always been the favoured design choice for spaceships) on Mont Blanc offers a series of advantages. 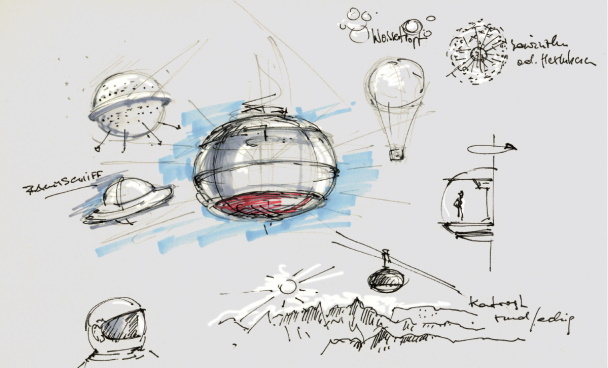 The sphere is the shape with the lowest external surface compared to its volume. It has no edges or corners, and therefore can support its load equally on all sides. It has no structural defects and is the shape that requires less energy. This means a lightweight, spacious and extremely safe construction is possible. Thanks to its large windows, the majestic 360 degree view becomes a unique and thrilling experience. The spheric structure stands in stark contrast against the jagged, harsh backdrop. The design follows clear and simple lines, with sober, timeless forms . The interior design highlights the cabin’s most important features: safety, comfort, cutting edge technology, and a spacious environment.